Enterprise started to take a serious interest in cloud computing about three years ago. But before moving critical applications out of purpose-built data centres I needed to find out the answer to one question. What were the barriers to entry for an Enterprise when it came to running critical workloads in the cloud? The penny drops around SaaS disruption! I first realised how disruptive Cloud could be when we started a satellite office in Sydney several years ago. A simple process such as expenses had been performed manually for more than a decade. We just stapled receipts to an expense form and dropped them into the Finance in-tray. Job done! But how were we going to streamline the process for the Sydney team? Scan it, post it? To understand our options, I asked our lead software architect to cost the development effort required to build the basic functionality into our existing sales and support system. What came back shocked me! To build the basic functionality, including development, support and opportunity cost we were better off subscribing to Expensify, a SaaS based application. The business case just didn’t stack. In fact, it was a 9 year return on our investment if we developed it ourselves! Subscribing to Expensify resulted in immediate gratification. We had solved the problem in hours not months and had a mature, fully featured solution to boot! In my mind, the SaaS revolution had begun. When we started the journey to cloud three and half years ago there was not a lot of customer interest outside the development community. Even then discussions around “agility” and “DevOps” were only for the very early adopters. There was a lot of marketing hype, but it was just that – hype. I needed to determine the fiction from the facts and determine what Cloud would mean to us as a business and our customers. What was the potential for it to disrupt our industry? To provide perspective, when I started investigating cloud I was running Infront, a specialist systems integrator that had been successful in building infrastructure solutions for enterprise and government for nearly 15 years. If the cloud promise was realised, we faced the likelihood that more than 50% of our current business would move to cloud based solutions. No matter how we looked at it, cloud would disrupt us if we didn’t first disrupt ourselves. But how were we to remain relevant? How could we continue to grow when SaaS and IaaS threatened the whole purpose of Infront? We knew we couldn’t compete as a cloud provider. Scale mattered and AWS and Azure had already established themselves as hyperscale providers. We needed a new approach. We needed to embrace cloud but from the perspective of the enterprise. What challenges would they face in making the transition to a hybrid cloud environment? This set me on a path of discovery. I did a lot of research, reading everything I could about cloud, 10 hours a day for nearly 12 months. In the end I came up with three beliefs, or tenets that I felt were critical problem statements that had to be solved if hybrid cloud was to live up to its promise. From hyperscale to managed service, cloud providers offer differentiated service levels, functionality and price points. To make an informed choice you need to be able to compare apples with apples. This turns out to be harder than a lot of people realise, but the benefits are profound when you do. For example, I did a lot of work modelling what it would cost to run what you would call traditional workloads on leading cloud providers. What I learnt was that if you could provision a workload, on a case by case basis, on the most cost effective provider, you could save more than 25 percent on average. When you consider organisation that are running large workloads (hundreds of VMs) in cloud, finding a cheaper provider can save hundreds of thousands of dollars. To provide this type of ‘Cloud Choice’, we had to understand how to index the rate cards for every provider we wanted to support – no easy task as there are literally hundreds of thousands of services across hundreds of regions around the world. But to do so would provide business the confidence to make informed decisions and help accelerate cloud adoption. One of our customers, a Federal Government agency, wanted to shift from a CAPEX model to an OPEX model in the cloud. I talked to the CFO and CIO and their biggest fear about moving to the cloud was lack of financial visibility and control. So I thought, okay, we need to extend to cloud a strong governance framework. We had a financial model that was well understood and broadly implemented across business today. We just need to help replicate that in cloud. We had to help establish and manage costs across a multi-cloud environment in context to cost centres, budgets, delegations and approvals. Oh, and don’t forget reporting and trending to help govern and control expenditure. 1-2-3 easy peasy! Companies have invested decades and millions of dollars in its people and the skill sets required to run today’s data centres. 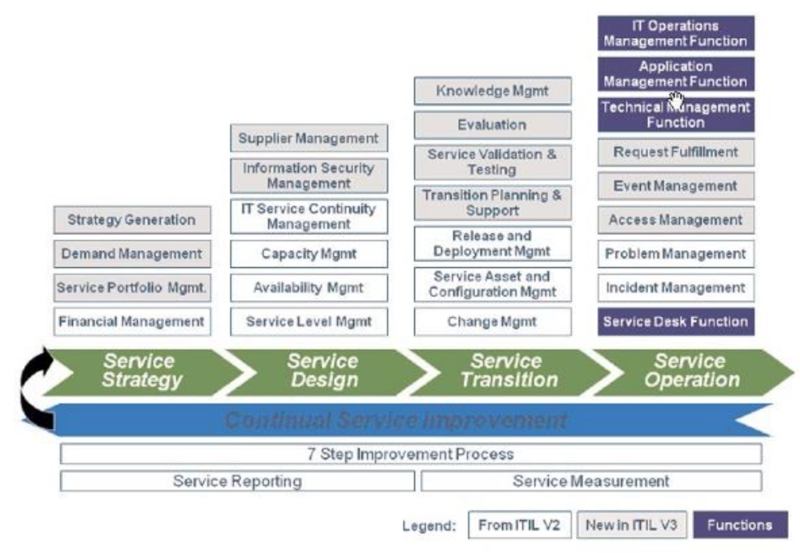 ITIL is often used in conjunction with a broad range of tools to help manage IT operations. None of which easily translates to cloud or consumption based computing. No-one wants to write off money they have already invested. That goes double when it comes to people you have trained to run your business. For hybrid cloud to be successful, we felt that as many of these existing processes, tools and skillsets need to leveraged and extended to cloud as possible. With these three tenets in mind we started the journey. I worked for the next nine months investigating every open source framework, every standards based initiative. I was looking for a way to help manage and secure multiple cloud services from a single dashboard. Three years ago this seemed like a bridge too far. The big emerging hyperscale providers, Microsoft, Google, AWS, were all building proprietary access methods. The private and public sides of the coin were not aligned. There was incompatibility at every layer. Take AWS. The network layer, the compute layer, the storage services were diametrically opposed to what Microsoft were developing, which were diametrically opposed to what Google was using. All three were developing at the speed of light and they were all developing for what one would call vendor lock-in – their own services based on their own standards and methodologies. So, what to do? We had a visionary statement. We were passionate about helping business simplify cloud by solving the three barriers to entry. But we also knew that there was not enough momentum in the open source community to help. OpenStack was a fledgling project years away from maturity. The only possible answer was to start with a clean sheet of paper and design our solution ground up. The result was ‘Project Arbitrage’, an internal project that would mature into the Buttonwood Cloud Exchange. When we started we didn’t know what the end state would look like. It was like building a church in the Dark Ages; we started building the walls without knowing whether the technology to build the roof would be available in time. Our blueprinting ‘keystone’ was TOSCA! In January last year, OASIS launched TOSCA, an open standards approach for describing complex workloads independent of provider. 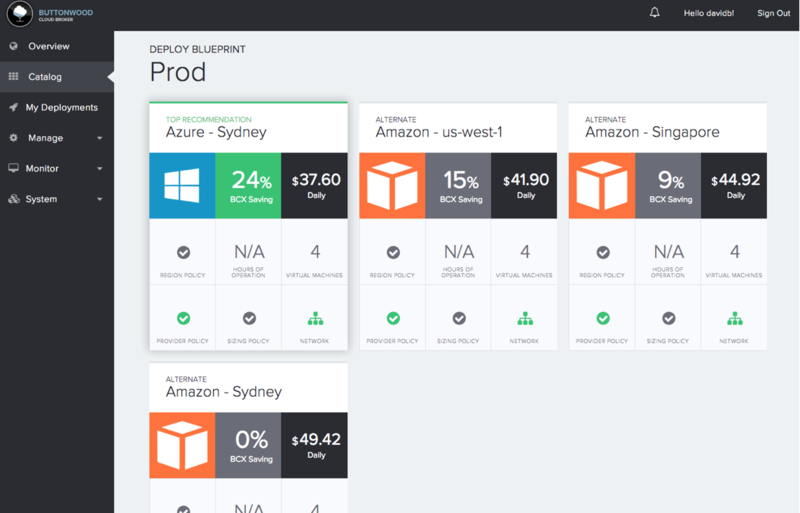 This ‘recipe’ could then be used to provision the workload across any cloud provider. TOSCA provided rules such as ‘depends on’ to help model dependencies between instances and describe a way to start and stop a workload without breaking the application. This was critical to our design as we wanted to improve the business case for cloud by ensuring that a workload only ran when required. Many services such as development environments only needed to be accessible 7am – 7pm, Monday thru Friday. If we could shutdown these services outside defined hours of operation we could save a customer 60% off their cloud bill. 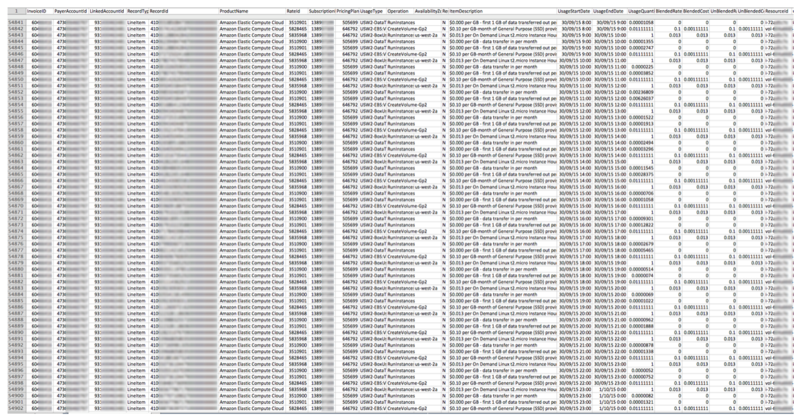 Finally, another advantage of TOSCA was the way it described every resource required to run the workload in cloud. This information, combined with the massive resource index we had created in the Cloud Exchange would allow us to accurately cost a deployment. By delivering transparency of pricing across all our providers, our customers could finally make an informed choice. Our networking ‘keystone’ was Intercloud! Quite serendipitously, in the same month that TOSCA launched, Cisco announced its secure data fabric – Intercloud. Intercloud was the plumbing we need to help provide operational consistency by extending the local network to public cloud with consistent security and network policies. Cisco had started the process connect disparate clouds together; The Intercloud, a strategy that paralleled the same ideals that helped them build out the Internet in the 90’s. After nearly three years Buttonwood was announced at Cisco Live 2015. We went into private beta in June 2015 and we launched our public beta on October 28 this year. The Buttonwood Cloud Exchange (BCX) is our flagship SaaS product built ground to deliver choice, governance and control of enterprise cloud services. Model and deploy multi-cloud workloads (IaaS) without vendor lock-in. Underpinning both services is a governance model that offers unprecedented financial transparency and control. I believe a cloud exchange, where a broker works out the best possible set-up, removes the barriers to entry for critical workloads in the cloud. It gives you choice, financial transparency and operational consistency. And it saves you from vendor lock-in. Is there another way? Would this work for you? Get in touch and let us know. Towards the end of 2016, Cisco abandoned their InterCloud strategy, a 1 billion dollar multi-cloud initiative. To help accelerate our time to market, Buttonwood had developed, in close partnership with Cisco, a seamless integration with InterCloud. With the InterCloud product now EOL, we had to accelerate the development of our own native integrations for cloud starting with AWS. With the release of Version 2.2 of the Buttonwood Cloud Exchange, we are proud to announce support for AWS, Azure, Oracle. These native integrations enable our customers to manage, protect, secure and govern cloud outcomes using the full power of each provider. Buttonwood was designed, not as a simple VM factory, but a true cloud management and integration platform. This means delivering, in the same simple, predictable way native cloud services to customers via our GUI composer – something that very few, if any, other cloud orchestration products can do. We continue to develop native integrations based on customer demand. As Buttonwood continues to grow, we want our platform to continue to support the leading cloud providers.